The constitutional republic that our founders intended to create has become a monster, and it is time to tame that monster and restore the federal government to its proper size and scope. The left loves big government, because it allows them to impose their progressive vision of how the world should work on all the rest of us. This is why so many control freaks are drawn to liberal politics like moths to a flame. Power and control are very addicting drugs, and those that crave these things on the left are never satisfied. 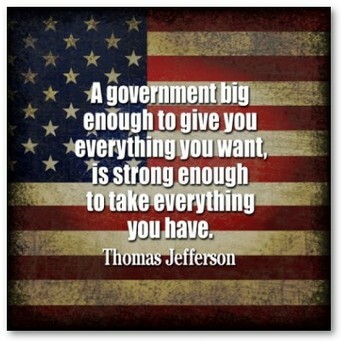 That is one of the reasons why the federal government just keeps getting bigger and bigger and bigger. If our constitutional republic is going to survive, we have got to start putting the “limited” back in limited government. I don’t see how anyone could possibly misunderstand that, but over the decades the left has worked very hard to make the Tenth Amendment as meaningless as possible. If we want to see the Tenth Amendment restored, we are going to have to be willing to fight hard in the court system, in statehouses all over America, and in the halls of Congress. And a good place for Congress to start would be to abolish the EPA. It is one of the federal agencies that is most wildly out of control, and fortunately there are a few good members of Congress that get this. Introduced by Rep. Matt Gaetz (R-FL1), H.R. 861 totals a mere one sentence: “The Environmental Protection Agency shall terminate on December 31, 2018.” That’s the same date of termination as another Republican bill to end the Education Department, which GovTrack Insider also recently covered. Gaetz is serving his first term in Congress and this is the first bill he’s ever introduced. Gaetz, a freshman, took aim at the EPA in a leaked email, obtained by The Huffington Post, saying Americans are “drowning in regulations” enforced by the agency. “Our small businesses cannot afford to cover the costs associated with compliance, too often leading to closed doors and unemployed Americans,” Gaetz wrote in the email, which was circulated among possible co-sponsors. If enacted, the bill would will give power back to the states and local governments, Gaetz said. “To better protect the environment we should abolish the EPA and downstream resources to states for more effective & efficient protection,” Gaetz said in a Facebook post Friday. Today, the EPA is packed with leftists that love to promote their political agendas by constantly coming up with even more business-killing rules and regulations. These unelected bureaucrats have been on a rampage in recent years, and most of what they are doing is unconstitutional according to the Tenth Amendment. Here in Idaho, the EPA has been a thorn in the side of miners, loggers and small businesses for decades, and it is a problem that has grown worse over time. At the moment, there appears to be little hope that the bill to shut down the EPA could get through both chambers of Congress, but that doesn’t mean that we will stop trying. But that doesn’t mean that the EPA is safe. In fact, some of the agency’s defenders worry that it faces a far more stealthy threat of being hollowed out. President Trump’s choice to run the agency, Oklahoma Attorney General Scott Pruitt, is known for targeting the agency with more than a dozen lawsuits. Environmental groups and policymakers fear Pruitt will dismantle many of the agency’s core functions methodically over time rather than trying to knock out the agency with one fell swoop. He will almost certainly try to unravel the Clean Power Plan, President Obama’s primary regulation aimed at addressing climate change, a multi-year process that could require careful reconsideration of legal and scientific arguments. He might also weaken—or shutter altogether—the EPA’s enforcement office, according to an Inside EPA report. Some of you may think that I don’t care about the environment since I want the EPA shut down. That is not true at all. I believe that we are facing some huge environmental problems and that we should all do more to take care of the planet that we share. But I also believe that the people of all 50 states should be able to determine how their own natural resources should be managed. The EPA has become a highly politicized organization, and it has become one of the favorite tools of the left for moving the “green agenda” forward. And of course this “green agenda” is being promoted on a global scale by the United Nations. This Agenda is a plan of action for people, planet and prosperity. It also seeks to strengthen universal peace in larger freedom. We recognise that eradicating poverty in all its forms and dimensions, including extreme poverty, is the greatest global challenge and an indispensable requirement for sustainable development. All countries and all stakeholders, acting in collaborative partnership, will implement this plan. We are resolved to free the human race from the tyranny of poverty and want and to heal and secure our planet. We are determined to take the bold and transformative steps which are urgently needed to shift the world onto a sustainable and resilient path. As we embark on this collective journey, we pledge that no one will be left behind. The 17 Sustainable Development Goals and 169 targets which we are announcing today demonstrate the scale and ambition of this new universal Agenda. They seek to build on the Millennium Development Goals and complete what these did not achieve. They seek to realize the human rights of all and to achieve gender equality and the empowerment of all women and girls. They are integrated and indivisible and balance the three dimensions of sustainable development: the economic, social and environmental. If you read over the 17 sustainable development goals which you can find right here, you will quickly notice that they cover virtually every form of human activity imaginable. That is become the “green agenda” is really just a nice way of introducing “global governance” to an unsuspecting public. The leftist control freaks at the UN literally want to closely regulate all human activity on the entire planet, and they are telling us that they need to do this in order “to save the world”. But as I discussed yesterday, we aren’t going to allow the left to steal our country from us, and we are going to greatly resist all attempts to erode American sovereignty. These archived Seth Rich Wikipedia entries show an exponentially-increasing level of establishment freakout every day.